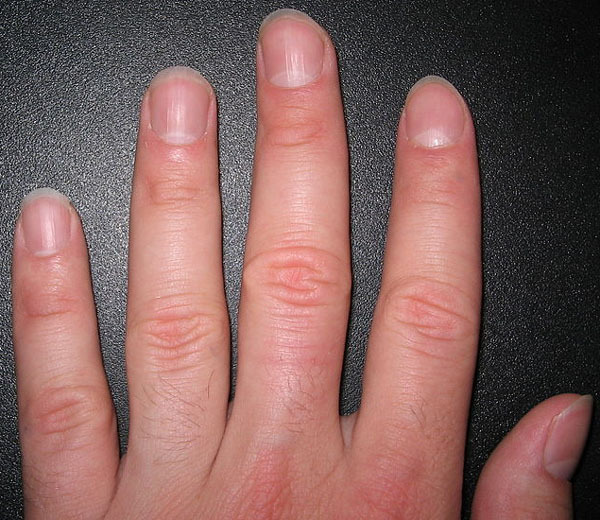 The Truth about White Spots on the Fingernail: Trauma, Stress or Zinc deficiency! 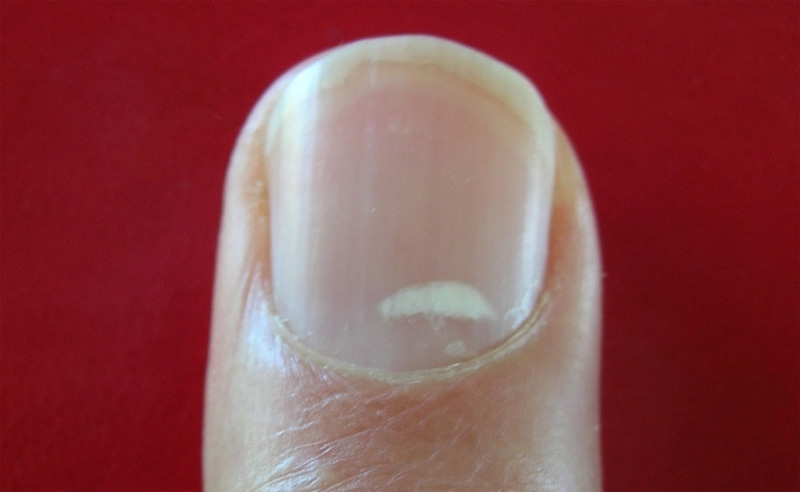 White spots on the fingernail are probably the most common ‘abnormality’ that can be observed in the nails. Many people associate them with calcium- or zinc deficiency. However, the truth is that usually they do not relate to any health problem at all: white spots are usually caused by a minor trauma! 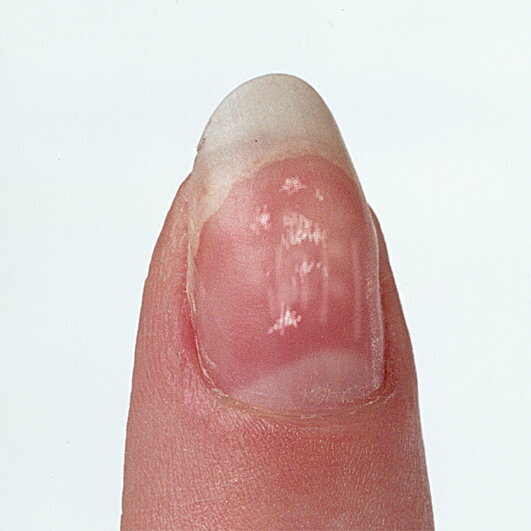 In medical science white spots in fingernails are also known as ‘leukonychia punctata’ – which related to the presence of nucleated keratinocytes. NOTICE: Narrow white lines in the nails are known as ‘transverse leukonychia’. Usually white spots are caused by random minor trauma (including: such as pushing nail cuticles, or ‘nervous’ cuticle picking), and therefore it is not surprizing at all that white spots are relatively common in the hands of children! White spots & zinc deficiency? Interestingly, in this perspective there even appears to be a connection between zinc definciency & trauma: stress! And in the field of palm reading professional palm readers have observed that white spots typically manifest in the fingernails when people experience a higher amount of stress than they usually do. But in general, one should not expect to find a zinc deficiency when a person has only a few white spots. Because actually, a number of conditions can arise from a lack of zinc. One of the most important, which also lead to its discovery, was the stunting of growth and the lack of sexual development in adolescent boys; adding zinc to the diet brought about a rapid improvement. Skin complaints such as dermatitis and a condition called acrodermatitis in babies may result from deficiency, and there may be slow healing of burns and wounds. So zinc deficiency may show up as white spots or bands on fingernails, but probably only when other conditions manifest as well! White spots & calcium deficiency? Conclusion: white spots do NOT indicate a calcium deficiency! • What are the most common nail disorders? • Fingernail disorders & medical hand analysis! FINGERNAILS – A barometer of your (past) health! Your fingernails provide a window to your health, and they are like the ‘rings of a tree’. They provide clues about your health during the last six months: because that is about the time nails need to grow out of the fingers (a fingernail grows about 0.1 mm per day). A healthy fingernail is characterized by: a smooth, rounded nail plate with a rectangular shape (at the corners slightly rounded). It’s color is pink, and at least the thumb requires to have a white crescent shaped lunula – in most people the lunula is not seen on the pinky fingers (some people have lunulae in all fingers where they take at most 1/3 of the pink area in the nail plate). Nail changes often reflect changes in the body. Medical science has identified & described literally hundreds different types of nail changes, and quite some of them have a highly significant correlation with the development of all kinds of diseases. But usually nail changes only rarely have a significance for a specified disease. But nail changes can also indicate high stress, physical traumas, hormone changes, and even an unhealthy food pattern. But often it takes some time to monitor the nature of the changes seen in the nails! And there Multi-Perspective Palm Reading can become involved, and even play a decisive role in the diagnosis process of the nail changes. Because Multi-Perspective Palm Reading describes the significance of nail changes in specified diseases, plus an overview of the other typical hand characteristics in those diseases. And therefore it can become very helpfull to find the true cause of nail changes when there are multiple options left according ‘the science of the fingernails’.